80/20 ground beef is meat that is comprised of 80% meat and 20% fat. The fat is essential for flavor and juiciness. 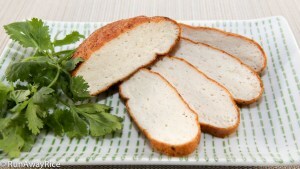 You can go a bit leaner if you’d like but some fat is essential for this recipe. It helps to spread out the meat as thinly as possible so it chills faster. If you have a metal pan or cookie sheet, use that as it cools quickly. Also, if your freezer doesn’t have any strange odors, you can leave the pan uncovered and that will speed up the chilling process. Leave the meat in the freezer as long as possible so that it’s almost frozen but just before it turns into a solid chunk of meat. (You should still be able to slice through it with a knife or large spoon.) Depending on the freezer, this could take from 1 – 2+ hours. Keeping the meat cold during the entire preparation process is key to achieving the springy texture. Work quickly with processing the meat and then return it to the freezer right away. Also, be sure to put the meat not yet processed back in the freezer. If at any point during this entire process the meat gets warm, the meatballs will be soft. Do not use too much baking powder. If you do, the Beef Meatballs will be nice and puffy immediately after cooking. However after cooling they will shrivel and look pitiful. Do not cook the meatballs in rapidly boiling water. This causes them to lose their round shape. Don’t skip the step where we dunk the meatballs in cold water after cooking. This helps to firm up the Beef Meatballs and aids in the springy texture as well. For folks looking to duplicate a restaurant recipe, my apologies, this is not that recipe. These Beef Meatballs will not taste like the restaurant version because I omit two very hazardous ingredients commonly used in the recipe: MSG and Borax. I cannot in good conscience share a recipe that uses MSG, known to cause hypertension and other health risks, and Borax, a chemical used in household cleaners and insecticides. Our health is more important than a tasty meal. Combine ice water, fish sauce, sugar, potato starch, beef seasoning, and white pepper in a bowl and stir to dissolve. Add the baking powder and mix with the marinade. Add the beef to marinade and blend well using your hands. Mix for about 1-2 minutes. Do not overwork the meat. Spread the meat mixture evenly into a large dish or plate. Cover with plastic wrap and place in the freezer. Freeze for 1 1/2 hours. Divide the meat into 3 equal batches. Add the first batch into the food processor. Place the remaining meat back in the freezer. Pulse the meat 10 times. Scrape down the side of the prep bowl and spread out the meat if it has clumped together. Processor for 10 seconds. Scrape around the bowl again. This is one cycle. Repeat this pulse/process cycle 2 more times for a total of 3 cycles. Scoop out the meat and place back in the dish. Add the next batch and process in the same way. Remember to return the dish back to the freezer each time you’re processing, so the meat doesn’t thaw. After the third batch is processed, add the first two batches back into the food processor. Add the vegetable oil. Process for another 30-45 seconds until thoroughly combined and smooth. Divide the meat in half and shape into 2-12 inch logs. Cover with plastic wrap and then freeze for 1 hour. Remove one log from the freezer. Pinch off a small amount, approximately 1/2 oz, of the meat mixture and roll into a ball. Wet your hands with water if they get sticky. Roll all meatballs using up the first log. Fill a large bowl with water and add to it 1 cup ice and 1 tsp vinegar. Bring a large pot of water to a rapid boil. Gently drop all the beef meatballs into the boiling water. Reduce the heat to Low and simmer for 7-8 minutes. Gently rotate the balls every few minutes. Transfer meatballs into ice bath and dunk the meatballs in the ice batch for 30 seconds. Transfer to a colander and allow to drain. Repeat the same steps for second batch making the remaining beef meatballs. 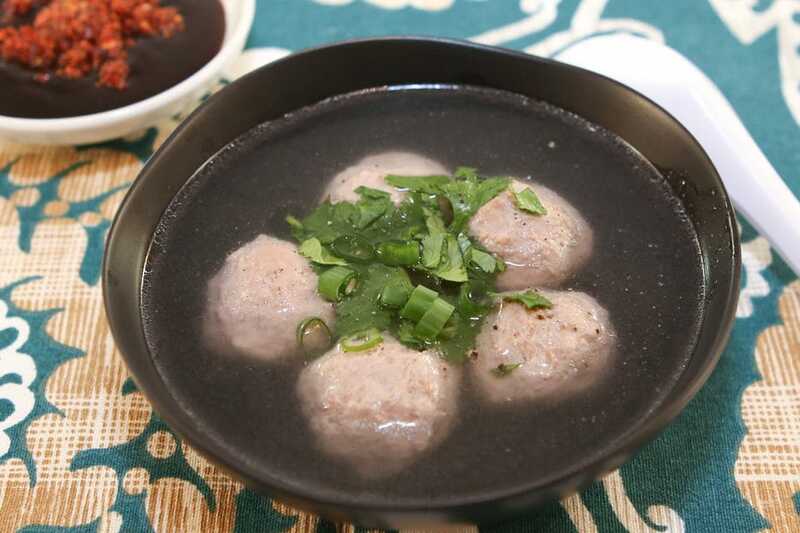 Serve these Beef Meatballs in soups, noodle soups, stir-fries, etc. 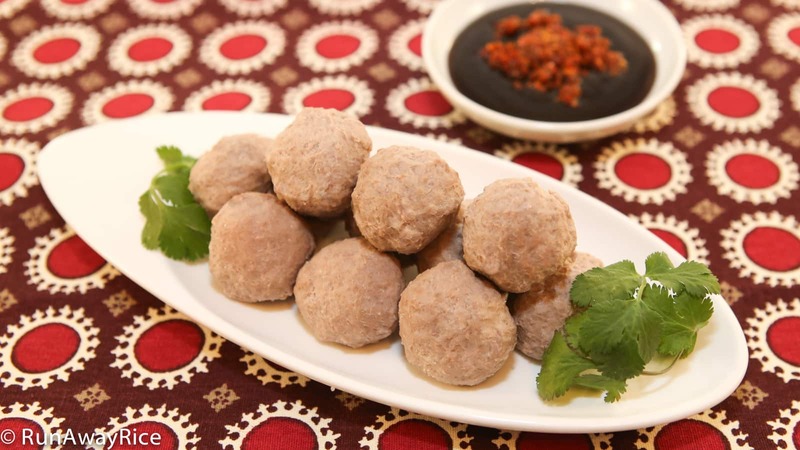 If you want to enjoy these Beef Meatballs as an appetizer or snack, serve with a Hoisin Plum Dipping Sauce and Satay Chili Paste. I buy the beef seasoning or beef buillon at the American grocery store. Look for the brand Herb Ox or Knorr. I like the Herb Ox brand as it doesn’t have MSG. Let me know if you any other questions. Good Luck! 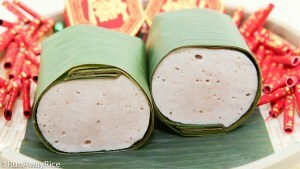 I love Vietnamese food, I am going to attempt this, this weekend. 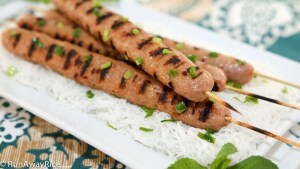 I love the taste of lemongrass, how can I incorporate it in this recipe? add it to the water, or grind it up into the meat, I don’t want it to affect the texture. Add the ingredients you enjoy! I love lemongrass too. Finely mince the lemongrass first and then add to the meat during the final processing. Let me know how the recipe turns out for you. Enjoy! was softer and not as chewy, and it seemed like to want to break apart. What should I do differently the next time ?. Do you think perhaps the meatballs were over-boiled? It sounds like the paste needs to be rolled a bit tighter. Try with more pressure next time. Good Luck! There is no oil in the recipe. Use water for your hands when forming the meat balls. 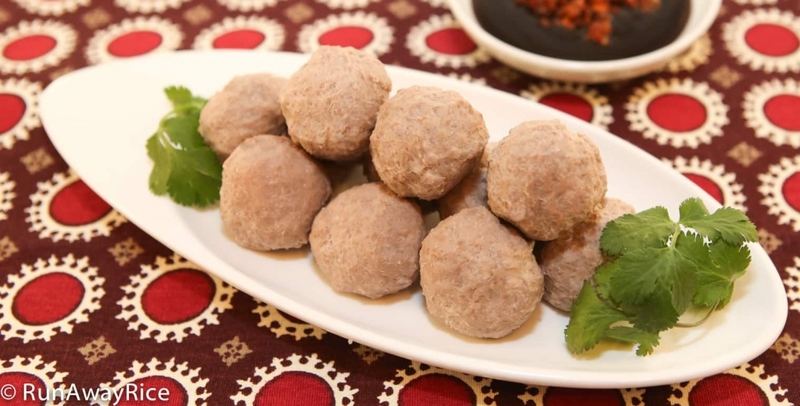 Your recipe for beef ball is the best among others. Just did my third batch and they are great. Perfectly snappy and delicious. I was intimidated but you made the recipe easy and simple to follow. Thank you! Do these meatballs freeze well like their restaurant counterparts?